Dr. Jack Arpano offers you pain and wellness treatment solutions with over 30 years experience in customized chiropractic care. 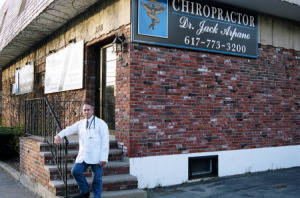 Arpano Chiropractic is centrally located in Quincy, Ma serving Quincy, Braintree, Milton, Weymouth and all the South Shore. We accommodate your schedule with flexible appointments to better assist your pain relief. If you are experiencing pain due to an auto accident or work-related injury; have back, leg, or neck pain, headaches or a specific spinal condition - maybe you just want freedom from pain - to improve your overall health, Dr. Jack Arpano will provide you a personalized evaluation for your individualized plan and a solution for your pain. Please check with us concerning any insurance that may not be listed. We do our best to help you. During your first visit to Arpano Chiropractic, Dr. Jack Arpano will explain to you the science of chiropractic and how it works.You will receive a full evaluation and together we'll determine if Dr. Arpano's chiropractic care is right for you; to best establish a good fit for your treatment. Dr. Arpano will develop your personalized plan of chiropractic - specific to your condition and health goals. New to chiropractic care? Want to find out more? Email us: [email protected] We will answer any of your questions as soon as possible. You are welcome to call 617-773-3200 and speak with us directly. We appreciate all your referrals. Help us help them. Email or call us. Arpano Chiropractic will share our health information with your friends and loved ones. They don't need to suffer in pain either. Want to receive our free health and wellness articles? It's easy to do. Subscribe to our newsletter and explore our wellness section: our animated exercise videos, articles and other resources.